Jeri, Nicole, Victoria, Elizabeth, and Josiah are in Iowa with Grandma Stogdill (at her new home). They were at the funeral last week in Moline, Illinois and stayed in the Midwest. The rest of us returned home last weekend. We planned a weekly menu on Sunday evening. Then Jeffrey and Sarah went grocery shopping Monday morning while Joanna was at her calculus class at Orange Coast College. Sarah helped me make my four lunch salads on Monday. When I walked in the door on Monday, they already had “jiffy pizzas” coming out of the oven. On Tuesday, they worked very hard making enchiladas and Spanish rice. It took over two hours but they turned out VERY well…I was impressed. They made a chicken version as well as a vegetable version with corn, broccoli, and mini bell peppers. Tonight (Wednesday) we had rice and either chicken or tofu (the latter for Joanna and me). We poured store-bought curry sauce (a Japanese variety) over the top. That was yummy too. Also Sarah helped me with my white laundry that had piled up. 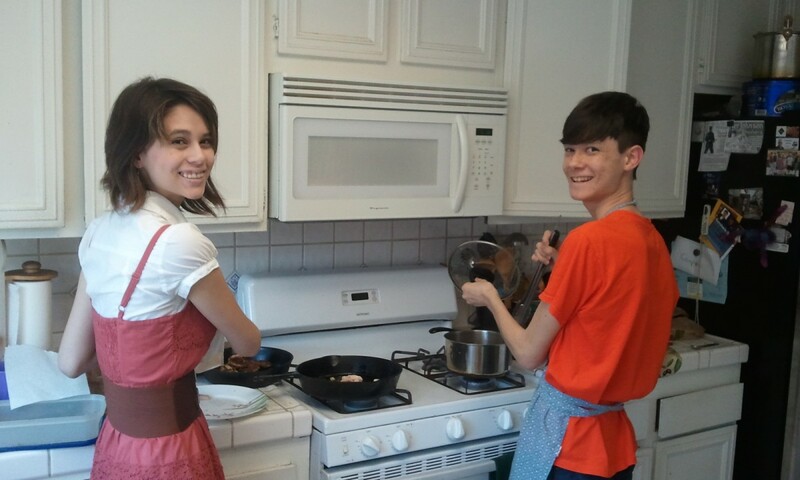 Here’s a picture of Joanna and Jeffrey cooking. Joanna and Jeffrey Cooking. Click for full size. Tim Pau speaking at Funeral Service. Click for full size. I’d like to share some of my dad’s life story. This won’t be exhaustive but I’ll be including a few family stories and highlight some of the challenges that my dad faced and overcame. My dad was born on July 15th, 1934 in Hong Kong. He was the first born of four children, two boys and two girls. After my dad, was born Sylvia, then Michael, and finally Vivian. 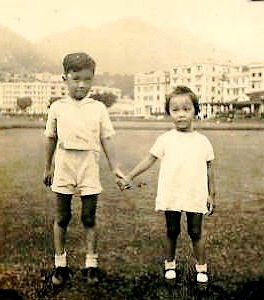 My dad didn’t have an idyllic childhood; as a young boy of age seven, he witnessed the Japanese army invade and occupy Hong Kong. Ian with his mom (Florence Pau). During the war, he contracted typhoid fever. His mom, Florence, bought buttermilk. The family sacrificed so they could afford to buy the buttermilk for him. He was eventually nursed to health after a few months. My dad was proud of his father’s contribution to the Allied war effort. During the war, his father, John, worked with the underground resistance forces. He had Boy Scouts on bicycles gathering information for the Allies. His dad owned a superheterodyne radio. These were outlawed by the Japanese. These “superhet” radios generate a signal to receive a signal. Using surveillance trucks that could pick up these radios’ signals, the Japanese would drive around in search of these radios. His dad would only listen to his radio at night while simultaneously listening for these trucks. 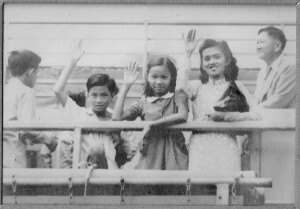 From the radio transmissions, the Pau family knew that the war was coming to an end before the Japanese occupying Hong Kong did. Ian and his sister, Sylvia. One time during the war, my dad’s mom took him and Sylvia shopping. They heard the Allied planes approaching. From radio transmissions, they knew that the intended target was a row of houses along the harbor where the Japanese military and their spouses lived. Because the store was several streets inland, they figured that they would be in the “safe” zone and could go shopping. Unfortunately the pilots were off target. One of the bombs hit the store where Mom and kids were shopping. Shelves toppled over. When his mom saw the children covered in red, she thought that they were badly hurt. But it was just broken bottles of red hot sauce. It took days for their hearing to recover. Unfortunately there were many Chinese casualties. The main hospital, St. Mary’s, was eight miles away atop Victoria Peak. The smaller hospitals weren’t equipped for injuries such as this. As a young boy, my mom recalls seeing a badly maimed mother crying for her family as she was literally dragging herself trying to get home. Life was hard during the war. At times, the family had to resort to catching sparrows for food. Then when the family ran out of firewood, they eventually burned his mom’s piano. This was so sad for her that she never played the piano again. Growing up, we never ate much rice…which is unusual for an Asian family. It’s because my dad didn’t like rice. He told us later that during the war that rice was used as a form of payment and, often times, unscrupulous dealers would add sand to increase its value. 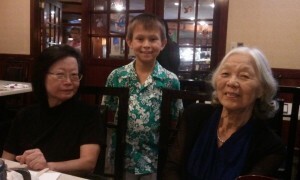 Ian, Sylvia, and their mom, Florence. Click for full size. After the war, my dad went to Honolulu for a year to go to live with his maternal grandparents. His plan was to become a U.S. citizen (but he didn’t until years later). My dad was very lonely because he didn’t have his siblings. His aunts and uncles didn’t talk to him because he wasn’t part of the family. He was even sent to a psychiatrist. But he was normal, just not getting any attention or love. 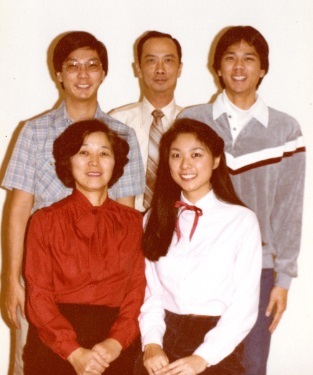 My dad then returned to Hong Kong to finish high school. Because of his scholastic ability, he was able to score very high on the college entrance exam (same one used in the U.S.). My dad applied to colleges in the United States. He received a four-year, full scholarship to Central Washington College of Education (now called Central Washington University) in Ellensburg, Washington. So in 1954, my dad came to the United States via freighter ship. At the time, the two common ways to cross the Pacific were either by passenger ship which might take two weeks or by freighter which often had a few simple cabins for passengers. The latter was cheaper but took longer. He boarded the ship in Hong Kong. The ship traveled around the Philippines to various ports picking up copra. The ship eventually arrived in San Francisco. My dad came with his birth certificate and immigration papers. 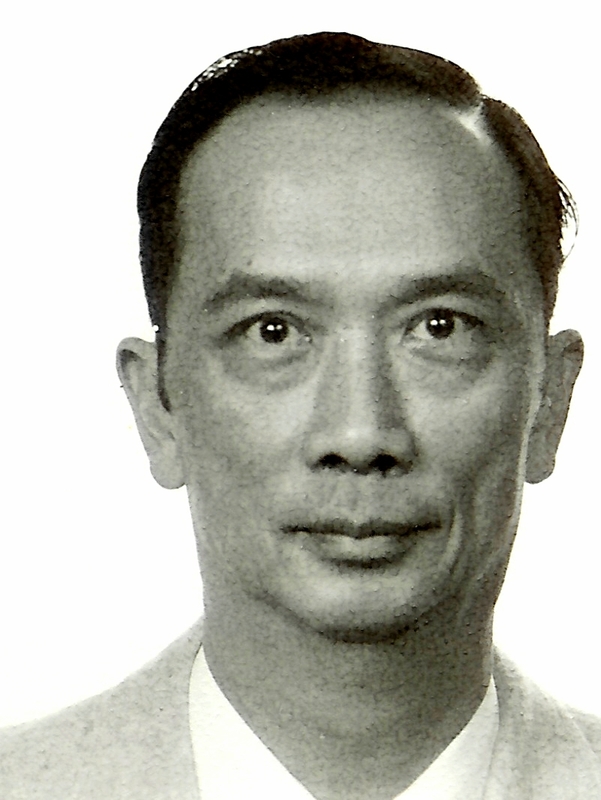 When he arrived in San Francisco, he declared his U.S. citizenship. Because his mother (Florence) was a U.S. citizen (she was born in Hawaii), Ian had until he was 21 to claim U.S. citizenship. 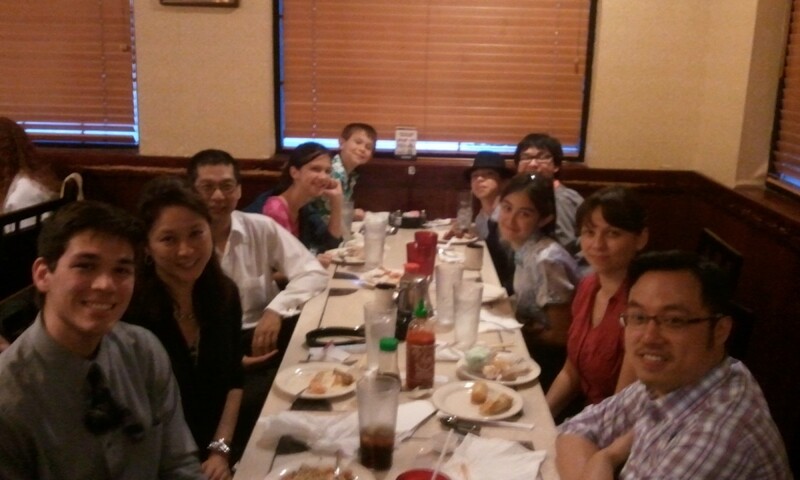 Being Chinese in America at that time was not easy. People would point him out. He spoke with a foreign tongue; his clothes were cut differently. He boarded a Greyhound bus to travel to Ellensburg which took about a week. Because he didn’t feel accepted, he didn’t make any stops along the way. Because his ship was late in crossing the Pacific Ocean, my dad was over a month late for school. He ended up losing his scholarship and had to work very hard to put himself through school. During these years, he was bullied a lot. Hazel worked in the cafeteria where my dad also worked. He cleared tables and washed dishes. Sunday supper was served restaurant-style with white tablecloths and waiters. Hazel was a senior when my mom and dad were freshmen. She lived on the same dorm floor as my mom who was the only Japanese girl there. This was back before cell phones; this was back before each dorm room had a phone. Each dorm floor had one phone. One person assigned to answer the phone. When the phone rang, everyone was curious as to whom it was for and what was said. With Hazel’s encouragement, my dad called and asked my mom for a date. So they began dating. In college, my dad was good in math and science and doesn’t remember what he majored in. My dad joined the College Republicans. He was a College Model U.N. delegate and went to San Francisco. He went to summer school and didn’t go back to Hong Kong for a long time. Although the Korean War ended in 1953 and the Vietnam War was just beginning, the Selective Service was drafting men for military service throughout the 1950s. So in 1956, running out of money to finish his last two years of college and not wanting to get drafted into the U.S. Army, he enlisted in the U.S. Air Force. He went to Texas for boot camp. He went to training school at Scott Air Force Base in Illinois. Then he was stationed at Geiger Field in Spokane. Ian Pau in the Air Force 1957. Click for full size. On September 14th, 1958, my mom and dad got married in Spokane, Washington at the Geiger Field Chapel in front of a few friends. He went to school for six weeks at Lowry Air Force Base in Denver, Colorado. His training was first in communications, then precision measurement equipment (test equipment calibration). He worked at Mica Peak Air Force Station which was an Air Defense Command radar station. He would work three days on, then three days off. My dad told us that they could throw hot dogs up in front of the large radar dish and the hot dogs would come down cooked. As a side note, the first commercially-available, microwave oven was called the Radarange. 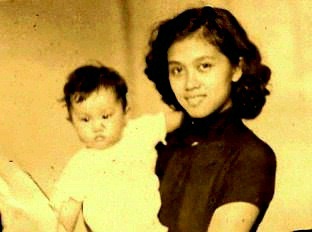 Then in 1961 when I was a toddler and Mavis a baby, my dad was assigned to Clark Field in the Philippines. During his 18-month assignment July 19th, 1961 to January 19th, 1963, he was able to visit his family just once. Because Mavis didn’t see her dad during this time, she would say “I have lots of Daddys.” She thought that all guys were daddies. Following the Philippines, my dad was assigned to Wright-Patterson Air Force Base in Ohio. While living in Newark, Ohio, Greg was born. Ian picked up ham radio while in Ohio. Our family can almost still hear him say “CQCQ this is WA8ITI” as he would try reach fellow operators. In Morse code, it was “dah-dit-da-dit dah-dah-dit-dah.” Before cell phones, this was a fancy way to communicate. I remember that our station wagon had a “halo” antennae attached to the rear bumper. From Ohio, my dad was assigned to Eielson Air Force Base in Fairbanks, Alaska about 3,800 miles away. I remember my dad driving our station wagon and camper up the long and lonely Al-Can highway. At that time, it was a gravel road. I remember my mom washing diapers in the clear running stream that ran by the highway. I can also remember my dad pulling the car over to the side of the road to point out wildlife that we had never seen before, like moose and caribou. In Fairbanks, Alaska, my dad joined the Jaycees, a social club. He also enjoyed the outdoors, hunting, and fishing. He trapped for furs; his catch included two minks, and one great horned owl (which had gotten caught in one of his traps). He would check his trap line once a week and take Thunder, our dog, along. I remember my mom and dad net fishing for King and Coho Salmon during the annual salmon runs. We had a blue Ford pickup truck with a camper on top. We three kids would ride in the camper above the cab. (I’m sure that that isn’t legal any more.) We headed to a spot on the Yukon River. The drive ended down a gravel, one-lane road that hugged the side of the river. During our time in Alaska, my dad’s brother, Michael, came over from Hong Kong to go to college. He stayed with us for part of a year before moving into the dorms. My dad was a shepherd and guide for his younger brother. He wanted to make sure that his brother was going to be successful in the United States. Over the years, my dad serviced his own vehicles. One time, he was working on the pickup truck engine. To keep warm, he climbed inside of the cavernous engine area and closed the hood. My mom was concerned when she came out and couldn’t find him anywhere. Following this assignment in the far north, my dad was stationed next in the deep South. We moved down to Valdosta, Georgia over four thousand miles away. I can remember the three of us kids lying in the camper over the cab singing “When the ants go marching in” over and over and over. He was assigned to Moody Air Force Base. Here, after years of taking night classes, my dad finally finished his Bachelor of Science degree at Valdosta State College. During his time in the Air Force, he saw a fair amount of discrimination against him. Because he didn’t look like others, because he didn’t talk and have the same mannerisms as others, he was often ostracized. While I was growing up, he never spoke about this; he never complained. I think that he didn’t want people to feel sorry for him and that he didn’t want his children to know that racism existed. Later he told us of a time when he was in the Midwest and wasn’t allowed to enter a restaurant because of his race. He ordered his food and had to eat out back. While in the Air Force, my dad saw fellow airmen that he trained get promoted ahead of him. As a result, he didn’t feel like staying in the military. So now, with his Bachelor degree, in 1970, he left the Air Force and decided to pursue a Master’s Degree in Economics at Iowa State University. When he told the family that we would be moving to Iowa, Mavis, Greg, and I didn’t like the idea because we thought that Iowa was one big cornfield. At Iowa State, my dad worked hard. In November 1971 (after less than a year and a half), he received a Master’s Degree in Economics. Because my dad knew that we children didn’t like uprooting and changing friends and schools, he decided to look for a job in central Iowa. That way, we could continue our education in Ames. My dad’s first job was with for the Iowa Development Commission in Des Moines. Later he got a job with Sundstrand in Ames. In 1974 through a Sundstrand colleague who landed a job with John Deere, my dad was able to get a job as an economist at the John Deere Administrative Center in Moline, Illinois. Our family was so happy. So through that winter and spring, my dad would stay in the Quad Cities during the week and come home for the weekends. Then in the summer of 1975, we moved to Bettendorf, Iowa. My parents chose Bettendorf because of its outstanding educational system. 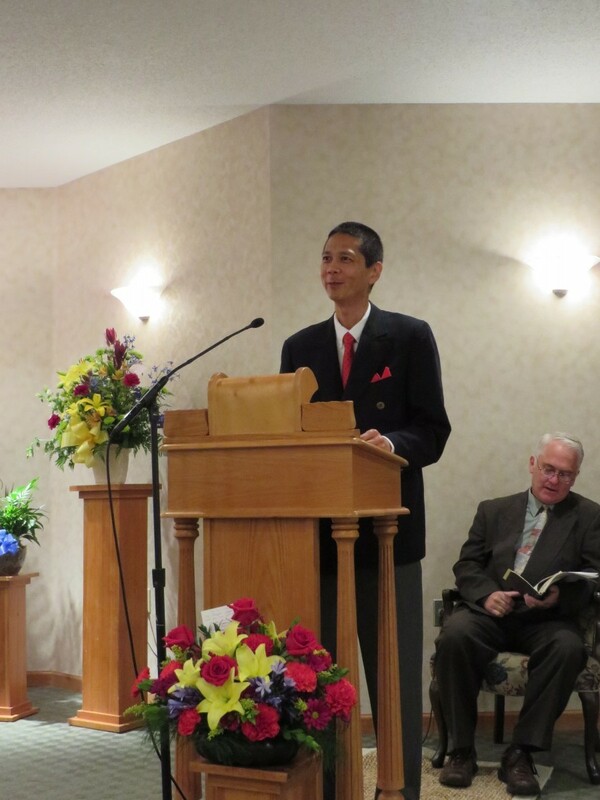 During this time, he joined Toastmasters, an organization that promotes public speaking skills. My dad was always one to talk; he could easily talk to complete strangers. I was amazed and encouraged by how many of his “mall walk” friends showed up yesterday at the visitation to say goodbye. While in Bettendorf, my dad took flying lessons for about a year. Then after his flight instructor died in a crash (and after he also realized that he’d never afford a plane), he gave up flying. Around 1980, his boss wanted him to write a rosier sales forecast than my dad thought that his computer projections supported. The executives in the company wanted to get their bonuses. My dad wasn’t willing and was fired for insubordination. This began a hard season for my dad. The economy had been in a recession. I remember him working on his resume. It seemed like he was typing and sending out cover letters and resumes nonstop. Ian was desperate for any job. For a short while, he even worked for a store at the mall. He eventually found a job at Cost Data Savings (CDS) in Davenport. This job lasted about a year; and my dad found himself back looking for work. He thought to take a class at Black Hawk College but ended up teaching a class that certified secretaries in computer skills. With the election of Ronald Reagan, the Rock Island Arsenal began hiring more people. My dad knew that they were taking applications, so he applied for a guard job…he was willing to do anything. In 1982 he landed a desk job at the Arsenal. Within about a year, he got a job teaching system analysis and data processing for the Arsenal. 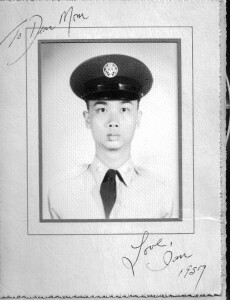 Because my dad had 12 ½ years of military service, he thought to join the U.S. Army Reserve in order to complete his military service so he could receive retirement benefits. Fortunately he applied just in time. He was one month away from being too old to be considered for the Reserve; a fact that he didn’t know at the time. Serving in the Reserve required my dad to travel to Des Moines one weekend a month and two weeks a year. Eventually he moved to the Reserve here in Davenport on Division Street. He served in the Army Reserve for a total of 10 years helping with their computer programming. In the early 90s, my dad along with a friend (Bill) that he met in the Reserves started Progressive Innovations Inc, a software company. In 1992, he brought me back from Virginia and gave me a job with the company to write a software application for chiropractors. The name of the software was ChiroPower. So, in case you’ve wondered, now you know the story behind his e-mail address: chiropwr “at” aol.com. Ian and granddaughter Elizabeth. Click for full size. Just before retiring in 1994, my parents moved across the river into Moline. (Thanks to the Iowa tax code.) After retirement, my dad continued working with computers and enjoyed digital photography. 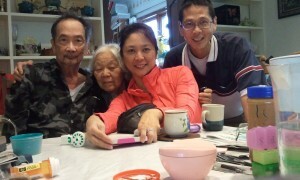 My mom and dad made a number of trips to visit their grandchildren in Ohio, Colorado, and California. They took a cruise to Alaska. However by 2007, my dad’s COPD (chronic obstructive pulmonary disease) had progressed to the point that his body required supplemental oxygen. Although he had quit smoking years ago, the damage from the past had taken its toll. His lungs had an increasingly harder time getting enough oxygen for his body. 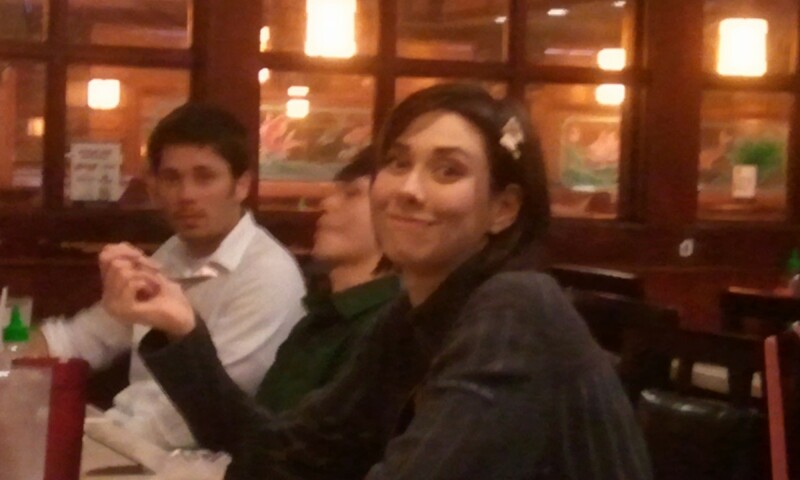 Ian, Greg (front), Jessica, Betty, Noble Shannan (back), Mavis Shannan, and Sebastian. Click for full size. Many people thought that my dad wouldn’t last very many years. However my mom took exceptional care of him. She would take him mall walking until he was no longer able. She did everything for him. She was a 24×7 caregiver extraordinaire. So in the end he made it seven years. Looking back at what my dad endured, I am proud and glad that he persevered. He came to a new country, lived a challenging life, and left a lasting legacy. Thank you, Dad! Ian, Betty, Mavis, and Tim – April 2014. Click for full size. 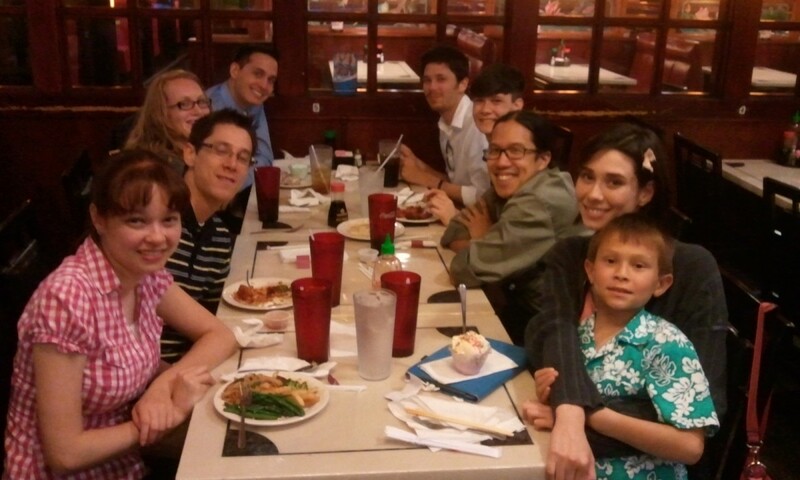 Ian’s brother, Michael, and his wife, Cyrilla, treated all of the family to an enjoyable meal at Osaka Buffet in Moline. Some of member’s of Tim’s family are vegetarians. The restaurant gladly prepared some vegetarian sushi for us. Click on each photo to view it full size. Sarah (Jason and Jeffrey in back). Click for full size. Nicole, Justin, Kelsey Shannan, Quest Shannan, Jason, Jeffrey, Jonathan Pai, Sarah, and Josiah. Click for full size. Cyrilla, Josiah, and Betty. Click for full size. 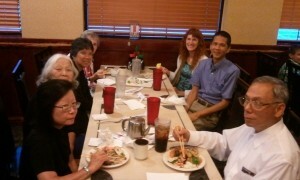 Cyrilla, Betty, Vivian Pai, Bev Stogdill, Jeri, Tim, and Michael Pau. Click for full size. Chance Shannan, Mavis Shannan, Greg, Elizabeth, Josiah, Sebastian, Noble Shannan, Jessica, Victoria, and Chris. Click for full size. Our dad/grandfather passed away this past Sunday. We love him and miss him. Ian in the Air Force 1957 with note to his mom. Click for full size. Funeral Service July 25, 2014. Click for full size. 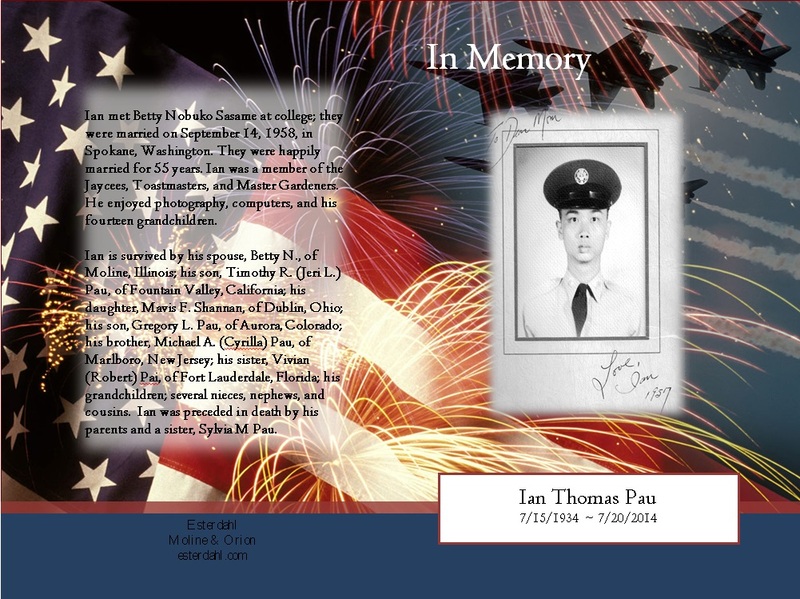 Ian Thomas Pau, 80, passed away on Sunday, July 20, 2014, at his home in Moline, Illinois after battling chronic obstructive pulmonary disease (COPD) for the past seven years. A funeral service will be held at 10:00 a.m. Friday, July 25, at Esterdahl Mortuary & Crematory, Ltd., 6601 38th Avenue, Moline. Visitation will be from 4 to 7 p.m. Thursday, July 24, at the funeral home. Following the funeral service, burial will be at National Cemetery at Rock Island Arsenal. In lieu of flowers, the family requests memorial donations be made to Honor Flight of the Quad Cities. Ian was born on July 15, 1934, in Hong Kong to John and Florence Awai Pau. After graduating from high school in Hong Kong in 1954, Ian received a four-year, full scholarship to Central Washington College of Education (now called Central Washington University) in Ellensburg, Washington. Before Ian received his degree, he joined the U.S. Air Force. He was stationed in the Philippines as well as the states of Washington, Ohio, Alaska, and Georgia. After receiving his Bachelor of Science degree from Valdosta State College in 1970, Ian left the Air Force and headed to Iowa State University in Ames, Iowa. In 1973, he received a Master’s Degree in Economics. Ian worked for Sundstrand in Ames, Iowa and then the Iowa Development Commission in Des Moines, Iowa before coming to the Quad Cities in 1975 to work as an economist for Deere & Company at their headquarters in Moline. He later began teaching computer-related courses at the Rock Island Arsenal. 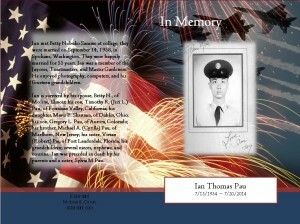 In addition, Ian served in the U.S. Army Reserve from 1983 to 1993. Ian retired in 1994. Ian met Betty Nobuko Sasame at college; they were married on September 14, 1958, in Spokane, Washington. They were happily married for 55 years. Ian was a member of the Jaycees, Toastmasters, and Master Gardeners. 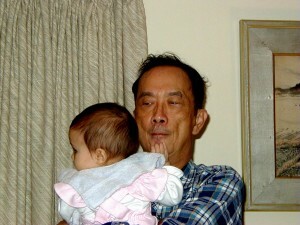 He enjoyed photography, computers, and his fourteen grandchildren. Ian is survived by his spouse, Betty N., of Moline, Illinois; his son, Timothy R. (Jeri L.) Pau, of Fountain Valley, California; his daughter, Mavis F. Shannan, of Dublin, Ohio; his son, Gregory L. Pau, of Aurora, Colorado; his brother, Michael A. 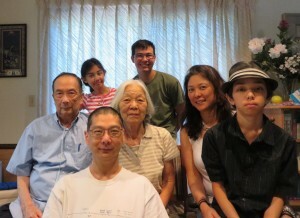 (Cyrilla) Pau, of Marlboro, New Jersey; his sister, Vivian (Robert) Pai, of Fort Lauderdale, Florida; his grandchildren; several nieces, nephews, and cousins. Ian was preceded in death by his parents and a sister, Sylvia M Pau. Online condolences may be left by visiting his obituary at esterdahl.com.